Background: Catha edulis Forsk. (Khat) is traditionally used for treating various disorders. Nevertheless there are no reports of any scientific assessment of its psychopharmacological properties. 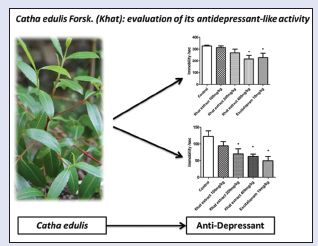 Objective: Therefore, the current study was designed to evaluate the antidepressant-like activity of Khat ethanolic extract using established animal models of depression and stress. Materials and Methods: Ninety healthy male albino mice were used in this study. Forced swim, tail suspension and head poking tests were utilized to evaluate the antidepressant-like activity of the ethanolic extract of Khat (100, 200 and 400 mg/kg, i.p.) and escitalopram (standard drug) which were administered 30 min prior to the tests. Phytochemical analysis of the standardized extract was conducted using liquid chromatography-mass spectroscopy (LC-MS). Results: A significant decrease in the head-dipping behavior was noticed after administration of 100, 200 and 400 mg/kg of Khat extract. Moreover, the extract significantly decreased the immobility time in tail suspension and forced swim tests. The presence of cathinone and cathine were detected in the extract using LC-MS. Conclusion: The current results suggest that the extract of Khat leaves has acute antidepressant properties and may have sedative effects. Abbreviations used: LC-MS: Liquid chromatography-mass spectroscopy; NIST: National institute of standard technology; SSRI: Serotonin reuptake inhibitors; FST: Forced swim test; TST: Tail suspension test. Liquid chromatography-mass spectroscopy data revealed the presence of cathinone and cathine in Khat extract. Obviously, in terms of pharmacological and toxicological impacts, several decades of concentrated clinical and experimental research on Khat have established a rich database. Although the scientific database on Khat is reasonably widespread and many studies have documented the impacts of Khat on mental and psychiatric health, few animal studies exist to substantiate those ethno-claims in animal models. Therefore, an immediate research effort is needed to investigate the role of Khat on animal models of stress and depression. C. edulis (stem tips and leaves) was collected in April 2014 from Jazan, Saudi Arabia. The voucher specimen (CE-E-2010-32) was botanically identified and kept at Substance Abuse Research Centre, Jazan University. Three hundred gram of fresh plant were cleaned and dried at room temperature in shade for one night. The leaves also dried in freeze dryer over two nights. The dried leaves (weighed 88 g) were then crushed with pestle and mortar. Extraction procedures were conducted based on Alsalahi et al., with some modifications where ethanol was utilized as extracting solvent. The crushed leaves were placed into a flask and ethanol (96%) was added to dip the leaves entirely. The mixture of Khat material and ethanol were stirred smoothly and then left overnight. Filtration was performed, first by use of gauze roll to isolate the big particles followed by filter paper to eliminate the fine particles. The filtrate was then evaporated using rotary evaporator under a vacuum at 40°C to remove all traces of ethanol. The resulting ethanol-free extract (12 g) constituted about 4% of the original fresh material. The liquid chromatography-mass spectroscopy (LC-MS) system consisted of an Agilent 1200 system, a solvent delivery module, a quaternary pump, an autosampler, and a column compartment (Agilent Technology, Germany). The column effluent was connected to an Agilent 6320 Ion Trap high-performance liquid chromatography (HPLC)–electrospray ionization-MS. The column heater was set to 25 ± 2°C. The control of the HPLC system and data processing were performed using ChemStation (Rev. B.01.03 SR2 (204]) and 6300 Series Trap Control version 6.2 Build No. 62.24 (Bruker Daltonik GmbH, Bremen, Germany). The analytes were separated using an Agilent Zorbax Extend-C18 column (80A°, 150 mm length × 4.6 mm, i.d., 5 μm) an Agilent-Zorbax Extend-C18 precolumn (Agilent Technologies, Palo Alto, CA, USA). The mobile phase was prepared by mixing 750 mL of 0.1% formic acid in water with 250 mL acetonitrile and was pumped at a flow rate of 0.5 mL/min. General MS adjustments were set as follows: Capillary voltage, 3500 V; nebulizer, 36 psi; drying gas, 12 L/min; desolvation temperature, 350°C; ion charge control smart target, 150,000; and maximum accumulation time, 150 ms. To prepare sample a weight of 20 mg of powder was extracted by 5 ml of methanol, filtered through 0.45 micron Nylon filter, dried with nitrogen gas, and the residue was reconstituted in 50 μL methanol. A volume of 5 μL was injected for LC-MS analysis applying positive-Auto-MSn mode (library for matching). The average MS spectra were confirmed by NIST2008 database. Ninety healthy male albino mice (30–40g) were procured from the Experimental Animal Centre of King Fahad Medical Research Center, King Abdulaziz University. Mice were maintained in polypropylene cages under a standard condition with 12/12 h light/dark cycle with free access to food and water ad libitum. Experiments were performed between 10.00 AM and 4.00 PM under standard conditions of temperature, lightening, and noise as was practicable. Escitalopram (Sigma-Aldrich, KSA) and Khat extract were administered by intraperitoneal (i.p.) route in mice. They were dissolved in normal saline and kept in refrigerator at −20°C prior to use and volumes injected were adjusted to 0.2 ml. The study was conducted after obtaining approval from Institutional Ethics Committee, King Abdulaziz University, Saudi Arabia. Mice were randomly divided into five groups, each group consisting of six animals. The mice were treated with Khat extract (100, 200, and 400 mg/kg, i.p. ), escitalopram (10 mg/kg, i.p. ), or normal saline (i.p.) 30 min before the experiment. Animals were prepared to swim individually in a polypropylene vessel (30 cm × 15 cm × 30 cm) with a water level of 15 cm at 25 ± 2°C. The duration of immobility (time), distinguished by total cessation of swimming with the head just floating above water level was detected during the final 6 min period of test. A reduction in the duration of immobility was an indicator of an antidepressant effect. Tail suspension test (TST) was conducted using five groups of mice each consist of six animals. The mice were administered with Khat extract (100, 200, and 400 mg/kg, i.p. ), escitalopram (10 mg/kg, i.p. ), or normal saline (i.p.) 30 min before test. Mice both acoustically and visually isolated were suspended on the edge of a [table 50] cm above the floor by the adhesive tape placed approximately one cm from the tip of the tail. Immobility time was recorded during a five min period. The animal was considered to be immobile when it did not show any movement of the body and hung passively. The hole-board model indicates that the head-dipping behavior is sensitive to the emotional state of animals and suggests that the expression of the anxiolytic state in animals may be reflected by an increase in head-dipping behavior. The hole board apparatus consisted of a wooden chamber (40 cm × 40 cm × 25 cm) with 16 holes (each of 3 cm diameter) evenly distributed on the floor. The apparatus was elevated to a height of 25 cm from the ground so that the mice could peep through the holes. The mice were treated with Khat extract (100, 200, and 400 mg/kg, i.p. ), escitalopram (10 mg/kg, i.p. ), or normal saline (i.p.) 30 min prior to test and kept in the apparatus. The numbers and the duration of head poking were recorded during the 5 min observation period. Data are presented as mean ± standard error mean multiple comparisons were performed using one-way ANOVA followed by Dunnett's test. P < 0.05 was considered significant. Statistical analyses were done using GraphPad Instat 3.0 (GraphPad Software, Inc., La Jolla, CA, USA). 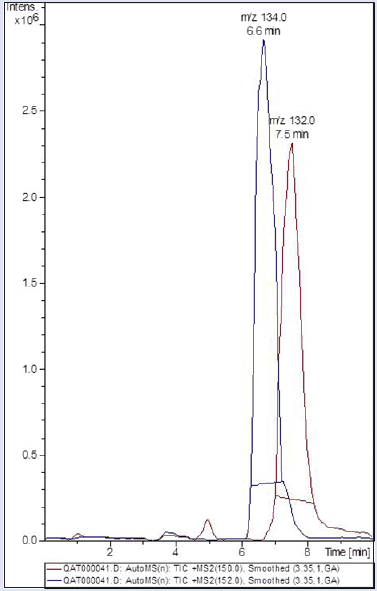 A representative MS chromatogram (extracted ion chromatogram) exhibited cathinone m/z 134 at 6.6 min and cathine m/z 132 at 7.5 min [Figure 1]. The average MS spectra were confirmed by NIST2008 database. MS chromatogram (data now shown) also exhibited fragments of cathinone and cathine. 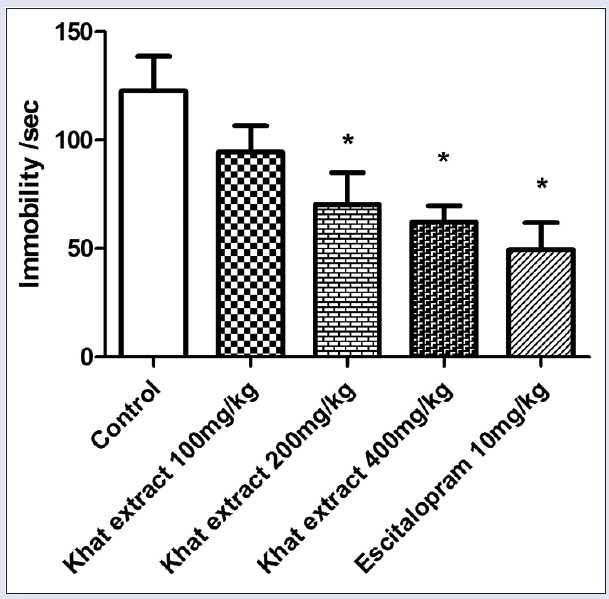 As shown in [Figure 2], significant (P < 0.05) reduction in the immobility time was observed with Khat extract (400 mg/kg) treatment as compared to control. Similarly, positive control escitalopram (10 mg/kg) also produced antidepressant action as indicated by a significant decrease in the immobility time. However, Khat extract (100, 200 mg/kg) was able to reduce immobility time but without significant difference (P > 0.05). 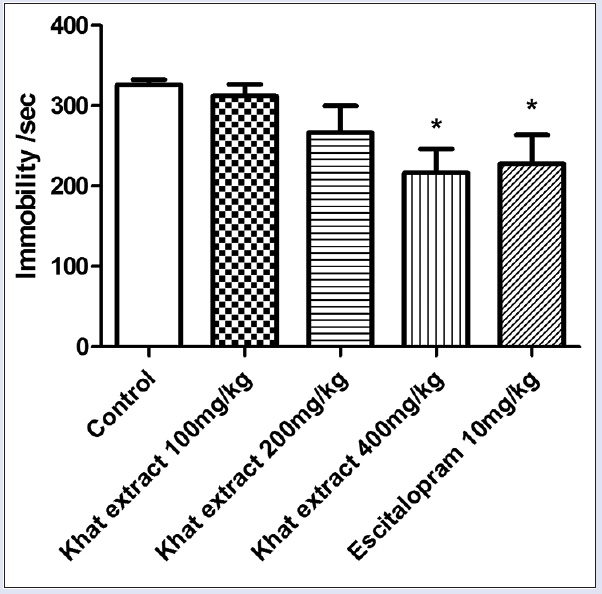 In the TST, there was significant (P < 0.05) reduction in the immobility time in the groups treated with Khat extract (200, 400 mg/kg) as compared to control [Figure 3]. Similarly, positive control escitalopram (10 mg/kg) also produced antidepressant action as indicated by a significant (P < 0.05) reduction in the immobility time. However, Khat extract (100 mg/kg) was able to reduce immobility time but without a significant difference (P > 0.05). 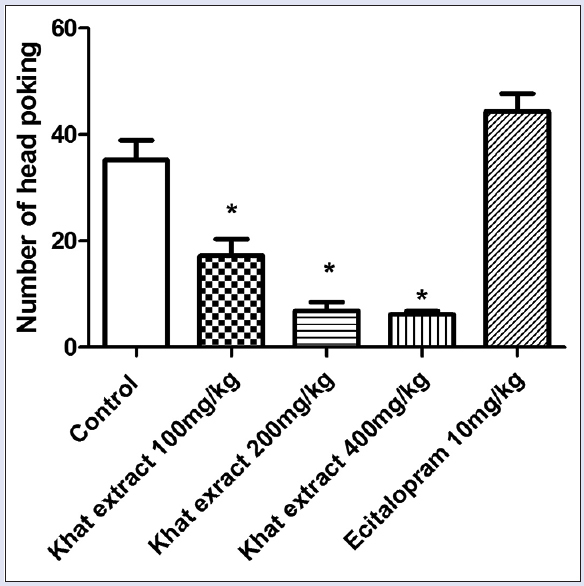 In head poking tests, there was significant decrease in the number of head poking after administration of Khat extract (100, 200, and 400 mg/kg) as compared to the control [Figure 4]. However, escitalopram (10 mg/kg) was capable to increase the number of head poking. Although the scientific database on Khat is reasonably widespread and many studies have documented its potential impacts on mental and psychiatric health, few experimental studies exist to substantiate those effects in animal models of stress and depression. The application of whole animal model is believed to be a quick technique for the recognition of neuropsychopharmacological effect of new phytomaterials., Therefore, the current study was designed to investigate the role of Khat on animal models of stress and depression using forced swim test (FST), TST, and head poking tests. Although a lot of studies demonstrated that cathinone is unstable and undergoes degradation during drying or extraction and becomes physiologically inactive after about 36 h of harvesting,,, the current investigation used standardized extraction method followed by spectroscopic confirmation. The phytochemical analysis (MS of Khat extract) indicated the presence of cathinone and cathine as shown in [Figure 1]. In this study, escitalopram was employed as a standard drug. The potency of escitalopram to inhibit serotonin reuptake (SSRI) and to induce antidepressant-like effects in applicable animal paradigms (FST; chronic mild stress; stress-induced ultrasonic vocalization) is noticeably augmented as compared with citalopram and other SSRI. The FST and TST models are currently the most extensively used tests of depression, and have been validated for use with both mice and rats. Both of these models follow different pathophysiological mechanisms., Previous pharmacological studies indicates that dopamine functioning is a necessity for performance of mice in the FST, whereas both dopaminergic and serotonergic systems are involved in TST model. Therefore, we selected these tests to examine the antidepressant potential of Khat. Current results show a significant reduction in the immobility time in Khat treatment group (400 mg/kg) as compared to control animals in the FST. On the other hand, the current results also revealed that pretreatment of stressed animals with Khat (200 and 400 mg/kg) produces a considerable decrease in their mobility in TST. Therefore, our results on both models reinforce that Khat has antidepressant-like activity. Similarly, positive control escitalopram (10 mg/kg) also produced antidepressant action as indicated by significant reduction in the immobility time in both models (FST and TST). Previously published studies on the chemical compositions of herbs and their bioactivity recommend that plants containing saponins, flavonoids, and tannins own bioactivity against many central nervous system ailments. Phytochemical data on Khat revealed the presence of many phytochemicals. It is probable that the biomechanism of anxiolytic action of Khat could be due to the binding of cathine or cathinone to various receptors involved in the anxiolysis processes, which has to be explored further. The results found in this study propose that the extract of the leaves of Khat possesses anxiolytic and muscle relaxant activities. Further, detailed studies deserve to explore the pharmacological mechanism(s) of action of the plant extracts, as well as the active chemical(s) accountable for its biological actions by focusing the possibility of both serotonergic and dopaminergic systems in the observed results in this research. Authors are highly recommending the performance of more animal's models to further investigate the anxiolytic-like effect of Khat with analysis of cellular proteins involved. Authors would like to extend sincere gratitude to Deanship of Scientific Research, Jazan University (Vote no: RG-3) for the funding the project. We express sincere appreciation and thanks to the all the faculty members and staff of the Department of Pharmacology, Faculty of Medicine, King Abdulaziz University for their invaluable suggestions and help during the study. We would like to extend our sincere gratitude to Deanship of Scientific Research, Jazan University for the funding in this project (RG-3-1/37). Authors express their sincere appreciation and thanks to the all the faculty members and staff of the Department of Pharmacology, Faculty of Medicine, King Abdulaziz University for their invaluable suggestions and help during the course of the study. Balint EE, Falkay G, Balint GA. Khat – A controversial plant. Wien Klin Wochenschr 2009;121:604-14. Al-Sanosy RM. Pattern of khat abuse and academic performance among secondary school and college students in Jazan region, Kingdom of Saudi Arabia (KSA). J Family Community Med 2009;16:89-95. Alsanosy RM, Mahfouz MS, Gaffar AM. Khat chewing habit among school students of Jazan region, Saudi Arabia. PLoS One 2013;8:e65504. Mohan S, Abdelwahab SI, Hobani YH, Syam S, Al-Zubairi AS, Al-Sanousi R, et al. Catha edulis extract induces H9c2 cell apoptosis by increasing reactive oxygen species generation and activation of mitochondrial proteins. Pharmacogn Mag 2016;12 Suppl 3:S321-6. Ageely HM, Agag AE, Mohan S, Shehata A. Catha edulis (khat) induces apoptosis in madin-darby bovine kidney cell line. Pharmacogn Mag 2016;12 Suppl 4:S454-9. Brenneisen R, Fisch HU, Koelbing U, Geisshüsler S, Kalix P. Amphetamine-like effects in humans of the khat alkaloid cathinone. Br J Clin Pharmacol 1990;30:825-8. Feyissa AM, Kelly JP. A review of the neuropharmacological properties of khat. Prog Neuropsychopharmacol Biol Psychiatry 2008;32:1147-66. Kalix P, Braenden O. Pharmacological aspects of the chewing of khat leaves. Pharmacol Rev 1985;37:149-64. Kassim S, Croucher R. Khat chewing amongst UK resident male Yemeni adults: An exploratory study. Int Dent J 2006;56:97-101. Warfa N, Klein A, Bhui K, Leavey G, Craig T, Alfred Stansfeld S. Khat use and mental illness: A critical review. Soc Sci Med 2007;65:309-18. Deyessa N, Berhane Y, Alem A, Hogberg U, Kullgren G. Depression among women in rural Ethiopia as related to socioeconomic factors: A community-based study on women in reproductive age groups. Scand J Public Health 2008;36:589-97. Al-Attas O. Khat constituents, neurological and medical effect. Khat in life of yemen and yemenis. Sanaa, Yemen: The Yemeni Research and Study Centre; 1981. p. 99-110. Odenwald M, Hinkel H, Schauer E, Schauer M, Elbert T, Neuner F, et al. Use of khat and posttraumatic stress disorder as risk factors for psychotic symptoms: A study of Somali combatants. Soc Sci Med 2009;69:1040-8. Odenwald M, Neuner F, Schauer M, Elbert T, Catani C, Lingenfelder B, et al. Khat use as risk factor for psychotic disorders: A cross-sectional and case-control study in Somalia. BMC Med 2005;3:5. Hassan NA, Gunaid AA, El-Khally FM, Murray-Lyon IM. The effect of chewing Khat leaves on human mood. Saudi Med J 2002;23:850-3. Alsalahi A, Abdulla MA, Al-Mamary M, Noordin MI, Abdelwahab SI, Alabsi AM, et al. Toxicological features of Catha edulis (Khat) on livers and kidneys of male and female sprague-dawley rats: A subchronic study. Evid Based Complement Alternat Med 2012;2012:829401. Steru L, Chermat R, Thierry B, Simon P. The tail suspension test: A new method for screening antidepressants in mice. Psychopharmacology (Berl) 1985;85:367-70. Sonavane GS, Sarveiya VP, Kasture VS, Kasture SB. Anxiogenic activity of Myristica fragrans seeds. Pharmacol Biochem Behav 2002;71:239-44. Reddy AJ, Handu SS, Dubey AK, Mediratta PK, Shukla R, Ahmed QM. Effect of Musa sapientum stem extract on animal models of depression. Pharmacognosy Res 2016;8:249-52. Oztürk Y. Testing the antidepressant effects of Hypericum species on animal models. Pharmacopsychiatry 1997;30 Suppl 2:125-8. Kalix P. Khat: A plant with amphetamine effects. J Subst Abuse Treat 1988;5:163-9. Fabre V, Hamon M. Mechanisms of action of antidepressants: New data from escitalopram. Encephale 2003;29(3 Pt 1):259-65. Sulakhiya K, Patel VK, Saxena R, Dashore J, Srivastava AK, Rathore M. Effect of Beta vulgaris Linn. leaves extract on anxiety- and depressive-like behavior and oxidative stress in mice after acute restraint stress. Pharmacognosy Res 2016;8:1-7. Bourin M, Chenu F, Ripoll N, David DJ. A proposal of decision tree to screen putative antidepressants using forced swim and tail suspension tests. Behav Brain Res 2005;164:266-9. Ohl F, Holsboer F, Landgraf R. The modified hole board as a differential screen for behavior in rodents. Behav Res Methods Instrum Comput 2001;33:392-7. Takeda H, Tsuji M, Matsumiya T. Changes in head-dipping behavior in the hole-board test reflect the anxiogenic and/or anxiolytic state in mice. Eur J Pharmacol 1998;350:21-9. Kennedy SH, Andersen HF, Lam RW. Efficacy of escitalopram in the treatment of major depressive disorder compared with conventional selective serotonin reuptake inhibitors and venlafaxine XR: A meta-analysis. J Psychiatry Neurosci 2006;31:122-31. El Mansari M, Sánchez C, Chouvet G, Renaud B, Haddjeri N. Effects of acute and long-term administration of escitalopram and citalopram on serotonin neurotransmission: An in vivo electrophysiological study in rat brain. Neuropsychopharmacology 2005;30:1269-77. Kurkin V, Dubishchev A, Ezhkov V, Titova I, Avdeeva E. Antidepressant activity of some phytopharmaceuticals and phenylpropanoids. Pharm Chem J 2006;40:614-9. Al-Mamary M, Al-Habori M, Al-Aghbari A, Baker M. Investigation into the toxicological effects of Catha edulis leaves: A short term study in animals. Phytotherapy Res 2002;16:127-32.